first of all, nice to meet you. I am Bram, the “out loud” part of Tingking Out Loud. 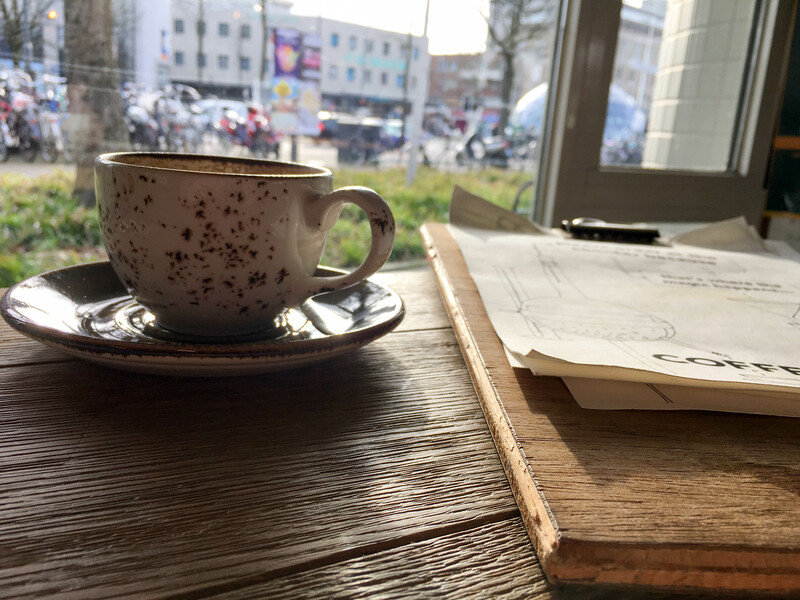 Ting asked me to write something about coffee places in Eindhoven, and specifically the ones I like and enjoy. As of late I am a flat white enthusiast and therefore thought I would review them for you. My first coffee experience was when I was 13 and with my parents in Italy. We went camping in the Northern part of Italy, Lago di Caldanazzo to be precise . We stayed on a campsite called Penisola Verde on this campsite there was a small caffé where I had my first cappuccino. I am not sure whether it was the taste or the caffeine rush, I was immediately hooked on this liquid energy. Since then I started to create a bit of a palate for coffee. Soon after cappuccinos I started to drink espressos and ristrettos and it basically became a ritual and eventually a religion to me. OK, I may exaggerate a tiny bit, but long story short I love coffee. 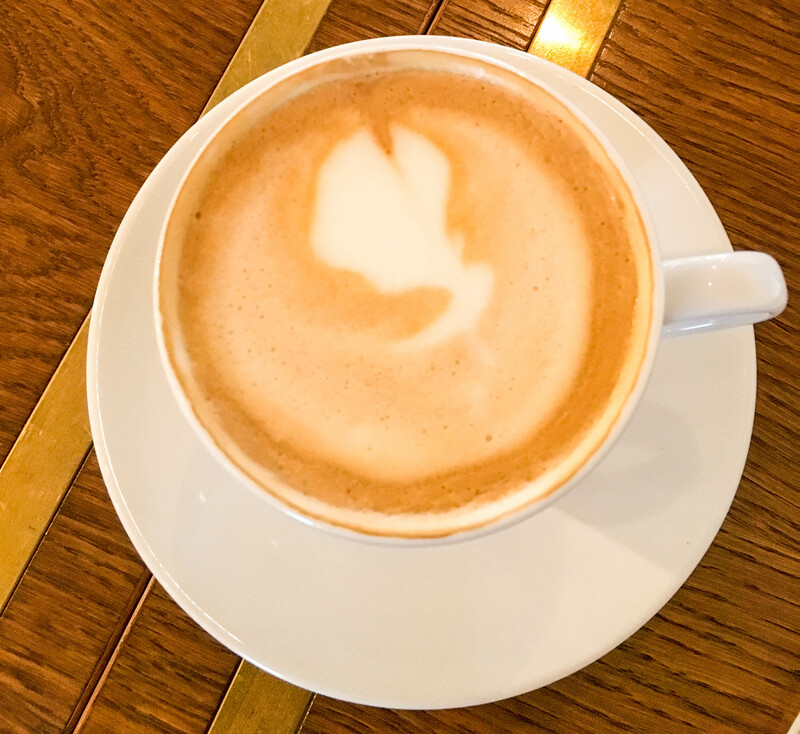 Now that I have established my so-called “coffee-credibility” I will try to explain what a flat white is, and what’s so great about this beverage. 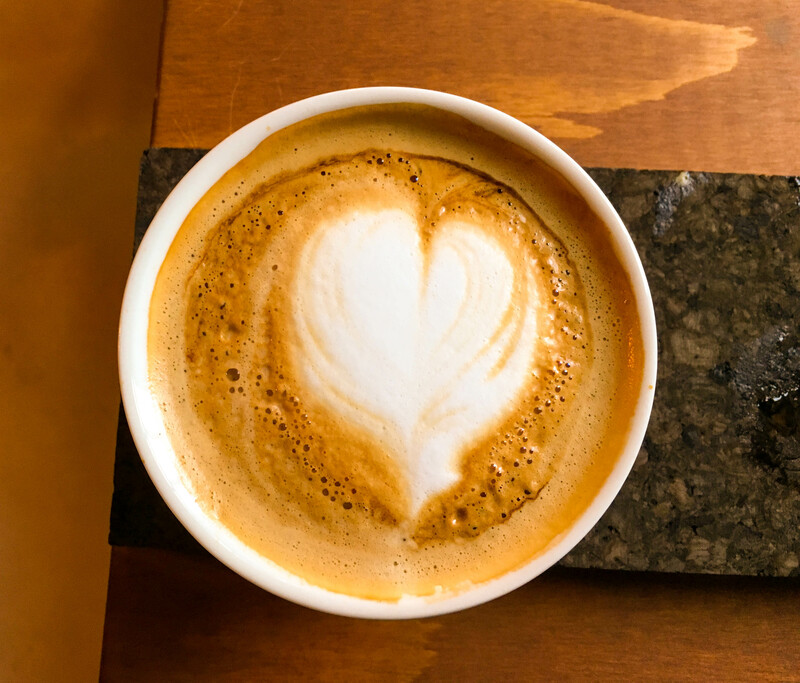 A flat white is a double shot of espresso combined with micro-foamed milk. Now the most important part is the velvety milk that incorporates with the crema and richness of the espresso. It takes some experience and skill to fully master this skill. However, when done correctly you have the richness and body of espresso combined with the softness and sweetness of a cappuccino. Besides this richness, body, softness, and sweetness it also makes a great Instagram post. Below I will give you 5 places in Eindhoven which are worth a visit. In case you want to get a cup of coffee near Eindhoven central station I highly recommend you to go to Coffeelab. So for all you commuters, leave your hazelnut frappuccinos with extra whipped cream at Starbucks and get a proper espresso or flat white at Coffeelab. My flat white was served in a nice rustic cup, the drink was very warm (maybe too warm) and the milk was well incorporated with the coffee. The taste was slightly nutty and intense, overall a very good flat white. One small remark, during the frothing I think they let too much air into the milk therefore the milk wasn’t perfectly frothed. 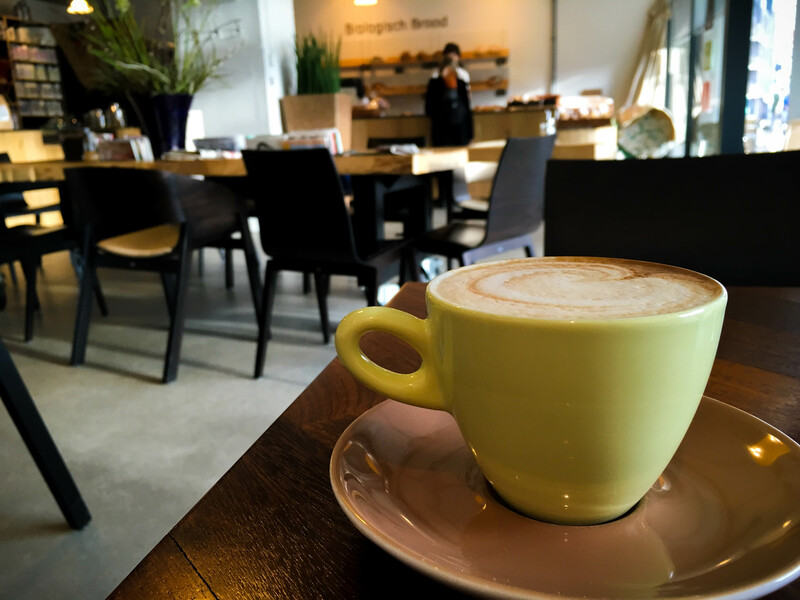 Coffeelab is also a very nice workplace, it has plenty of places to sit in solitude and focus. In summer they have a small terrace outside where you can enjoy the sun. Coffeelab is perfect for when your train is delayed for the 10th time in 2 days. All in all, just swing by and see for yourself! 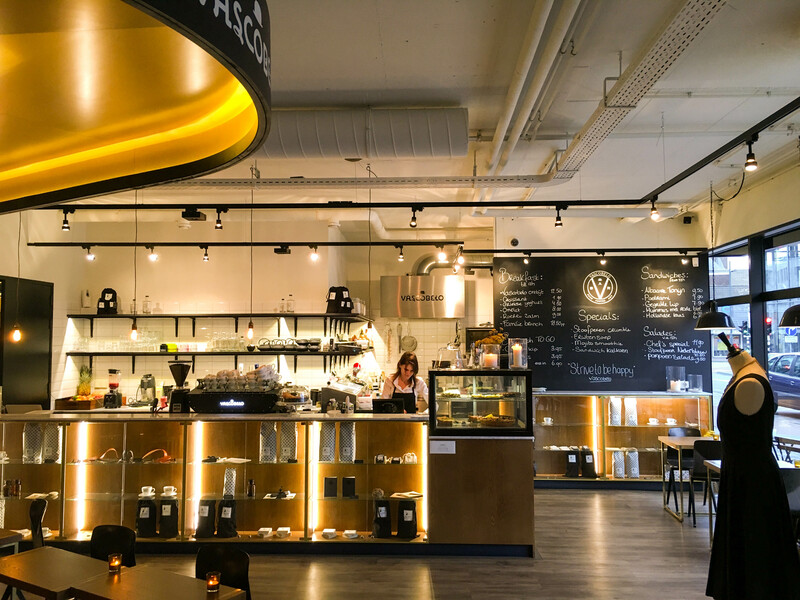 Situated in Philips’s old lightbulb factory Coffeeyou is serving a very decent cup of coffee. With its high ceilings and large windows the place feels very spacious. Besides a cup of coffee they also sell a variety of bread and coffee beans. During my first visit I told Ting the barista looks like a guy that has been in the insurance world for about 20 years and finally figured out he liked brewing coffee more than sitting behind a desk. The second time I came by he proved me wrong and showed me he is more than just a guy that knocks on your door to tell you your current insurance policy doesn’t suffice. He made a more than decent flat white. Well frothed milk, good temperature, resulting in a tasty flat white. I was pleasantly surprised. I sat down for almost two hours and had the most productive two hours of my life. Its a comfortable place to work, chat, and relax. In conclusion, a good flat white, lovely place and worth a visit. Lucifer coffee is one of my personal favourites in Eindhoven. It is located in the popular neighbourhood of de Bergen, which is basically around the corner from where we live. I first got to know Lucifer about 2 months ago and have been a regular visitor ever since. They use a roasted blend from Blommers in Nijmegen to make their flat white, I love the chocolate aftertaste you get from this bean. The barista at lucifer became 5th at the Dutch Latte Art Championship 2016, and you can see/taste that the guy knows what he is doing. I normally go here during the weekdays because Lucifer is packed during the weekend and it is hard for them to keep up with the constant stream of customers. In addition, lunch is very affordable and, although I haven’t tried it yet, according to my lovely sister very good. 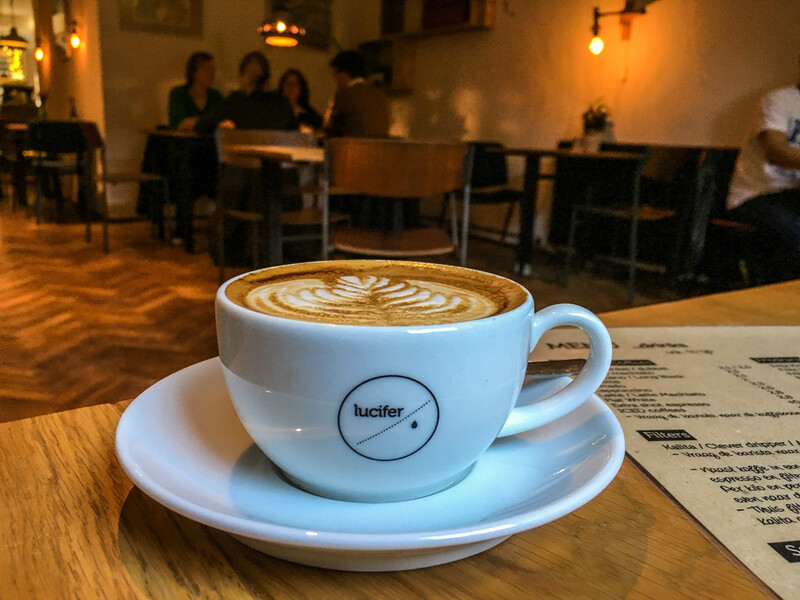 In conclusion, go to Lucifer and treat yourself by ordering a lovely flat white, as you can see the latte art is impeccable. 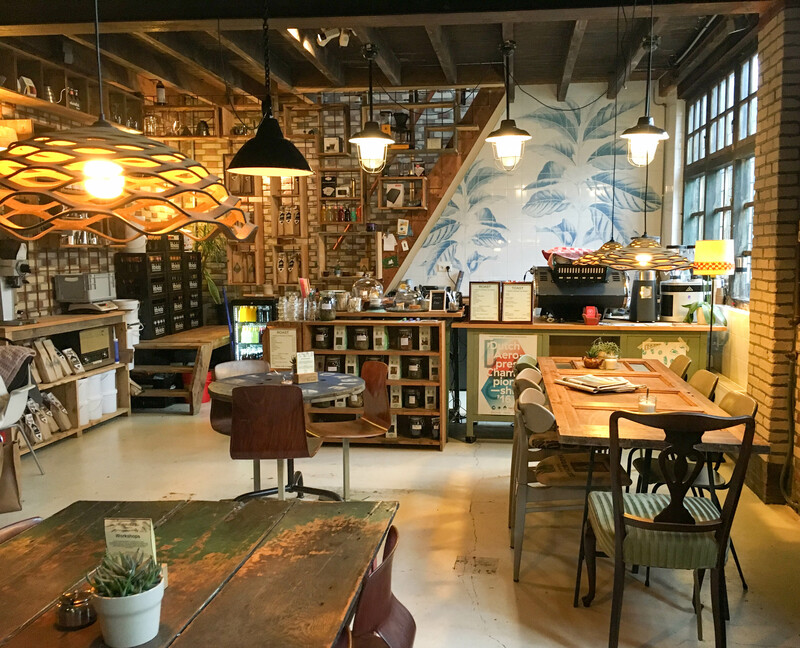 Do you have the feeling all coffeeshops in this blogpost are way too mainstream? Do you deny being a hipster, but do you like to wear vintage Versace and roll up your skinny jeans? Great! You will love Stadsbranderij. 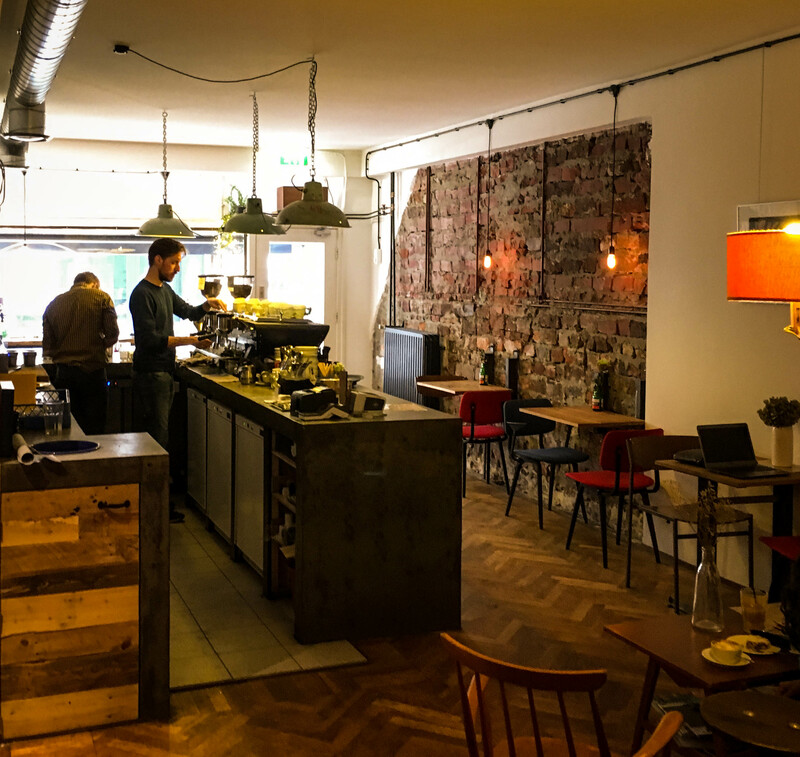 If I would have to rank the coffeeshops mentioned in this blogpost, Stadsbranderij would be a very good 2nd. 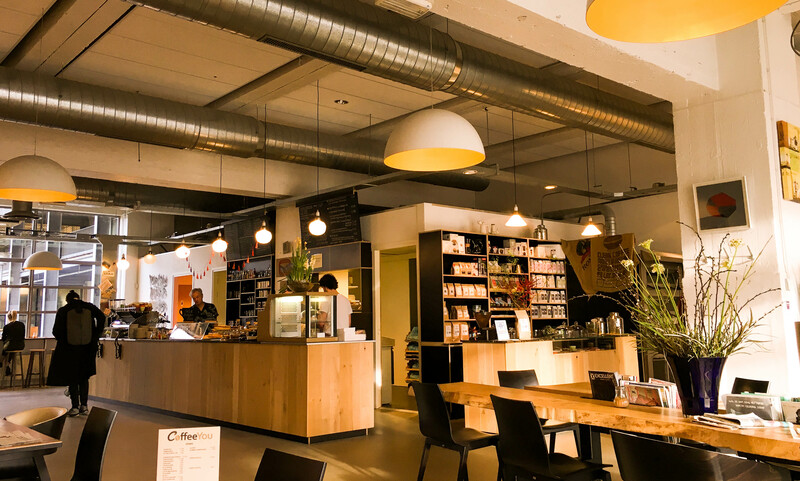 For a very long time it was Eindhoven’s hidden gem right in the city center. In 2008, the owners started with their own “mobile espressobars”, and served coffee at festivals and events. In the summer of 2014 they opened the Stadsbranderij in a small alleyway in neighbourhood of de Bergen. 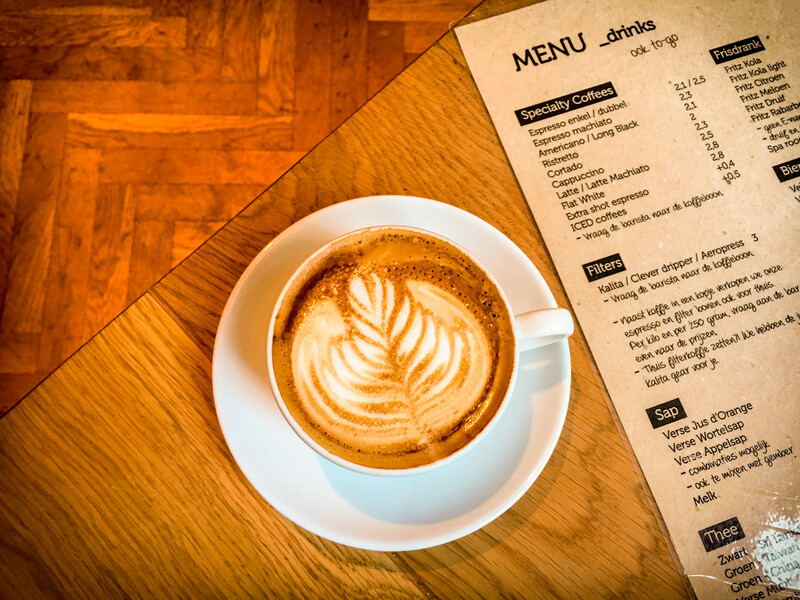 In addition to serving coffee they also roast their own coffee beans, they get their beans at the source without interference of multinationals or an intermediary. Therefore they can assure us, the customers, a certain quality and a fair share for local farmers. My flat white was fine, nothing special this time but a decent cup of coffee nevertheless. 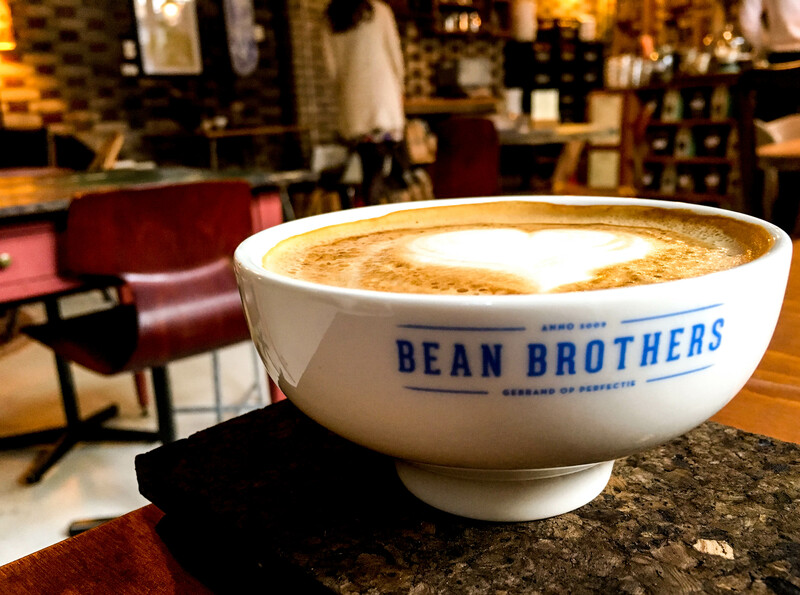 However in general this place is great, it has a very unique urban vibe going on and they keep on surprising me with their wide selection of beans and coffee related products they sell. As you can see on the pictures the place looks amazing, definitely worth a visit! Do you think Stadsbranderij might be a bit too hipster for you? Maybe Vascobelo suits you a bit better. Vascobelo is a Belgian chain of, as they say, cafe brasseries. They are located in several cities all over the world. I have been to the one in Eindhoven several times, and visited the one in Antwerp during my Christmas trip with Ting. Overall I like their concept of trying to create an atmosphere in which you enjoy drinks and food with friends. In Antwerp this really worked out well, in Eindhoven however I still don’t really feel that vibe. My flat white wasn’t great this time, the milk froth was too thick for a flat white and the milk slightly scalded (too hot). The main issue, in my opinion, is that they don’t always have the same barista and therefore the quality isn’t always the same. On the other hand, the place looks very modern and their v-shaped seating area looks stunning. The food, as mentioned in an earlier blogpost, is tasty and definitely worth a try. However, this is a flat white review and not a food review. Therefore I have to say that with Stadsbranderij and Lucifer around the corner there are definitely better options. 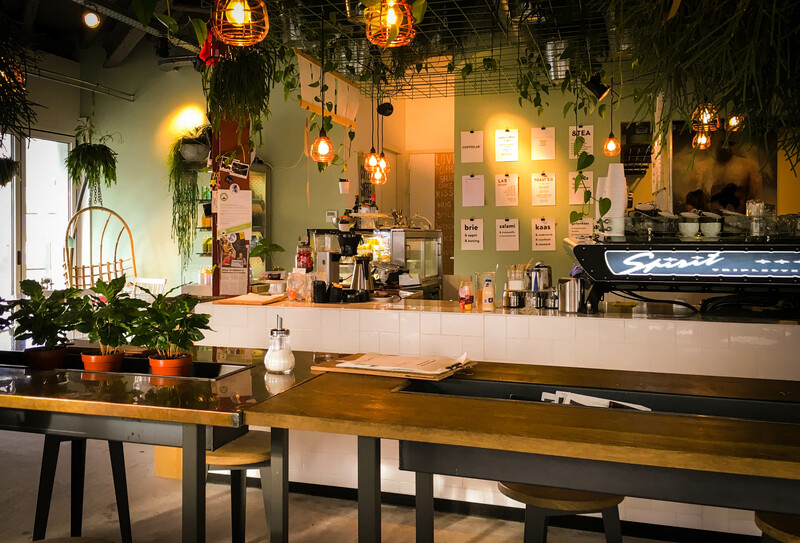 Ever since coffee became popular on Instagram Eindhoven got more and more coffee places. I believe the places above are some of the best in town, and I hope you enjoy them as much as I do. Thank you for reading this blogpost and I hope you enjoyed Tingking Outloud’s first guest post. p.s. 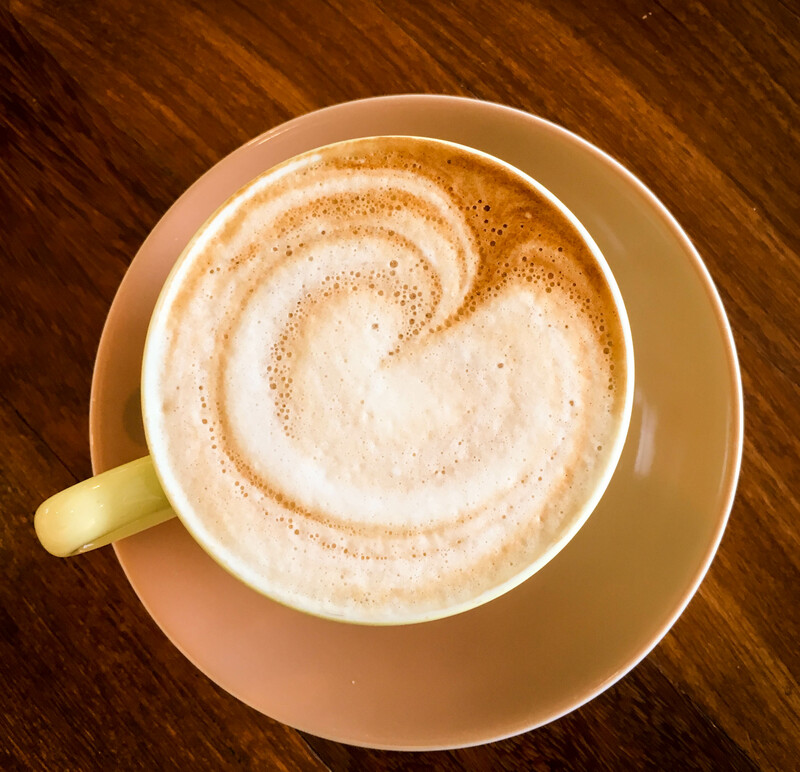 If you want to find a good coffee place in your neighbourhood check out this website. It shows all places that have a Kees van der Westen coffee machine. These coffee machines are basically the rolls royce of coffee machines and shops that have these machines are truly devoted to making the best coffee possible. Therefore 9 out of 10 times you are sure that the coffee will be good.